Although we take pictures of every mecate we make, there's no way we can show all of them. Here are some of our favorite out-of-the-ordinary mecates. To see our standard one pattern mecates, take a look at our mane hair mecate gallery. This gorgeous mecate is 3/8" by 24' and changes from white at the knot end through 5 shades of gray to a very dark gray at the popper end. It features 7 colors in all. To top it off, the starry night pattern is thrown in as well making a very stunning mecate. K.C. Murphy of Boston, Mass. owns this rope. This mecate was made for clinician Peter Campbell of Wheatland, Wyo. He wanted a mecate with both reins the same color and then a different pattern in the lead portion of the rope. The light part is Gray 1 and the lead is black with a white fleck. This is a really unusual mecate we designed for Barb Pribeck of Kewaunee, Wis. for her bay horse. The bulk of the mecate is a black stripe, two stripes of red chestnut, a stripe of white and two more stripes of red chestnut. Then toward the tail of the rope, the red chestnut drops out and is replaced by a lighter sorrel. Finally, at the end of the mecate, the black strand changes to white so the popper end is a simple sorrel and white. Kathy rides black and gray horses and wanted something that would look good on either color. This mecate is like nothing I've ever done before. The solid white at the popper end really sets off the white stripe in the black and white section. Kathy is from Dayton, Wash.
Debbie Lewis of Sonora, Calif. needed a mecate that would go with blacks, bays and grays. This two pattern mecate did the trick. With the popper end a brighter pattern overall emphasizes the simplicity of the pattern throughout the rest of the mecate. The mecate on the left belongs to Buck Brannaman of Sheridan, Wyo. It's a 1/2" four strand duplicate of a 3/8" get down rope I made for him 8 or 9 years ago. He loved the pattern, but wanted it a little larger, so this was the result. The one I like is the one on the right. It's an extremely smooth 1/4" for a two rein outfit. Although the pattern is very simple, it's gorgeous in that respect. This is quite a twist on a variegated mecate. Two strands change from light to dark from the knot end. At the same time, another pair of strands go from dark to light from the knot end. The only constant is the pair of white strands that split them K.C. Murphy of Boston, Mass. owns this mecate. Here's a close up of the popper in K.C. 's mecate. Jesse liked our Starry Night mecate, but wanted something a little different. The end result was this Starry Night done in reverse. The bulk of the mecate is our lightest shade of gray and then it's set off with black flecks. Very interesting. This little 3/8" get down is elegant in it's simplicity. When I started this rope it was going to look like it does at the popper end. But about halfway through I had an inspiration and this is the result. One of my absolute favorites. Kansas Saddlery has this classic example of a sorrel variegated mecate. It is made of white and 23 shades of flaxen and sorrel. The graduation from one color to the next is imperceptible. This get down and the next have quite a story behind them. As part of the first Cowboy Working Arts by Women gear show in Cody, Wyo. this fall, I agreed to do a rope making demonstration. Before the actual demo, I decided to give my crew a trial run. This rope and the next were done start to finish in front of the Irma Hotel in downtown Cody. I gave Jesse, a saddlemaker from Pritchett, Colo., this get down for all of his help that weekend. By the way, his wife, Sharri, is a very talented saddlemaker and CWAW member. Rawhide braider and CWAW member Cindy Beaver was my other assistant during the demonstration in Cody and earned this get down for her trouble. Both this rope and the one above ended up being pattern changes when an eager-to-help spectator moved the stick I was using to mark my halfway point for changing colors. In the end, I'm glad it happened that way. This memorial mecate is stunning. Three strands are a light chestnut color that came from a horse of Wendy's that had to be put down. Of the remaining three strands, one is white and the other two are a sorrel variegated. Jim Wolbert of Woodbine, Md. wanted a gray variegated with fewer shades of gray. We used five different grays in this mecate and the overall effect is beautiful. Shannon Wrango of Cambridge, Kan. wanted a rope as pretty as her bay paint horse. This three color "idiot rope" fit the bill. It was made to tie up on a bosal so that one rein was sorrel, one black and when the tail came out of the bottom wraps, it was solid white. This is a 1/2" mecate done in a light sorrel, midrange red chestnut and off-white. It has three very distinct patterns. Shayne Jackson of Libby, Mont. owns this rope. This is a classic example of a pattern change mecate. Most of my two pattern mecates are made so that the second pattern is contained in the tail section of the rope. This one is a particular favorite of mine. This is a very beautiful sorrel variegated mecate. It has 21 colors in it; white plus 20 shades of sorrel. Buck Brannaman of Sheridan, Wyo. owns it. Another like it is on exhibit in King's Saddlery Museum in Sheridan. I can't get enough of this one. Steve Howard in Eagle, Colo. has it now. I've only made two of these and he has both. He rides mostly bay horses, so his wife, Moni, and I came up with this pattern for him. It looks wonderful on a bay, but would look great on many other colors of horses as well. This mecate was made for Jim Reilly of Carlsbad, Cal. It is a dark red chestnut, dark flaxen, black and white. Just a very stunning pattern. 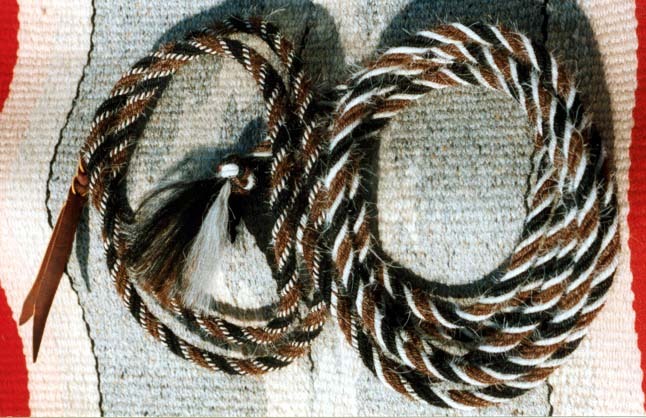 At the popper end it is red chestnut and white, then one of the white strands changes to black and the two red chestnut strands blend into dark flaxen. This is one of my original patterns. I call it "Starry Night." I've done several variations of this pattern over the years. This mecate belongs to clinician Buck Brannaman, Sheridan, Wyo. Now here is an amazing mecate. 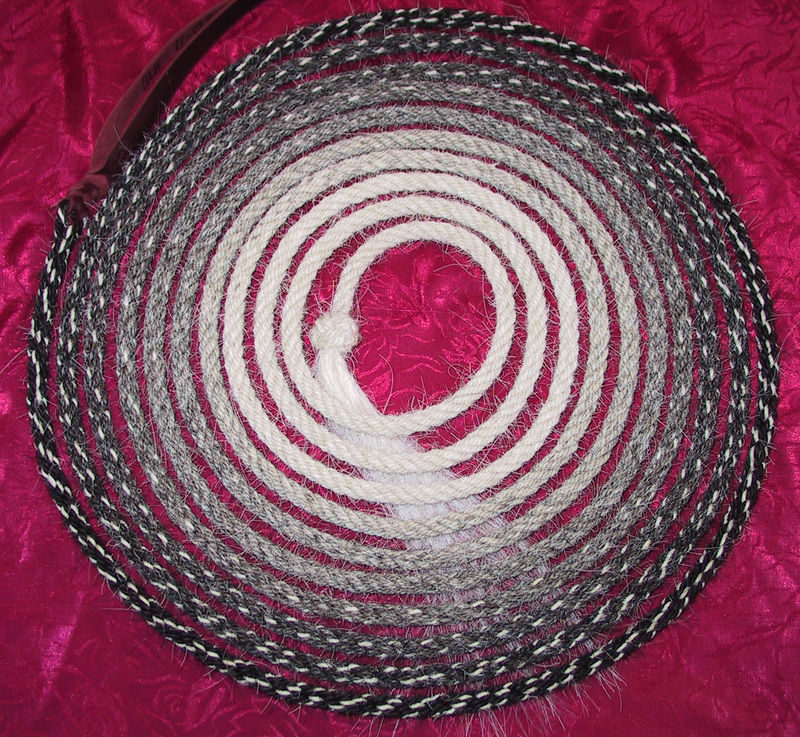 This rope is variegated from black to white through 13 shades of gray. If you look closely, you can see that there is really quite a bit going on in this pattern. From the knot end, four strands change from white to black. One strand goes from black to white and one strand stays white. Then I added the speckles in at the popper end to give it another pattern entirely. Shayne Jackson of Libby, Mont. owns this rope. This particular type of three pattern mecate is commonly called an "idiot rope." I'm not making this up. I think the term originated in California or Nevada. It is so called because one rein is black, one rein is sorrel and the tail is white. With each one a different color, the theory is that any idiot can ride. Pull on the black one to go right, pull on the sorrel one to go left, and if you're holding the white one, you should be leading your horse. I made this mecate up for Donna Keagle in Lockport, Ill. She supplied me with the mane of her first horse and we put his hair in the white section. Note the stamped popper on this rope. Here is another pattern change mecate. It is done in a light red chestnut, light sorrel and white. There are five patterns in this mecate. Now here is a wild looking pattern change mecate. It has three patterns with one pattern making up the bulk of the rope. The other two patterns are intended to be in the tail. I just love how bright the pattern is at the popper end of this mecate. Here is a close up of our stamped poppers. Note the very interesting mecate in the background. This mecate was made at the same time as Buck Brannaman's variegated sorrel mecate. If you look closely you will see two strands go from light to dark, starting at the knot end. one strand goes from dark to light, and one strand stays white. This rope is white plus 20 shades of sorrel. Suzie Puckett of Sheridan, Wyo. owns this mecate. Here is a really nice two pattern mecate I made for Lori Wigen of Trout Creek, Mont. The main body of the mecate is a pretty black, sorrel, and white. Then I used the same colors in a much more contrasting pattern for the tail of the rope.